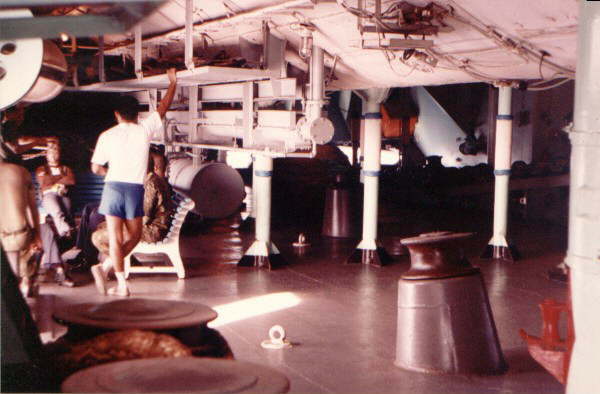 In the forecastle, just below the flight deck looking aft. At the roof (right side) you can see the 'V' shaped structure that covers the catapult gear. 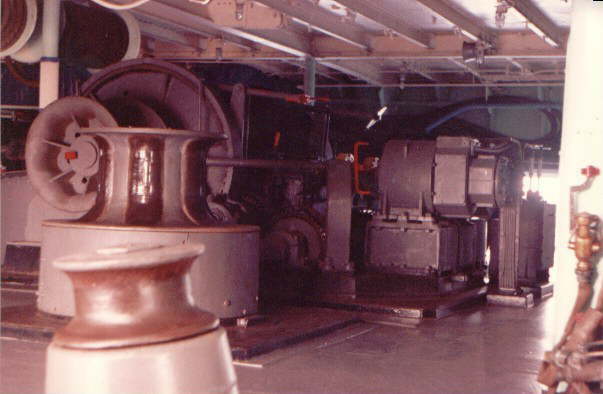 The anchor hoisting machinery room. The bow space looking forward. You can see the light passing through the openings in the hull. The 'V' shaped structure protruding from the roof is the covering of the catapult gear. 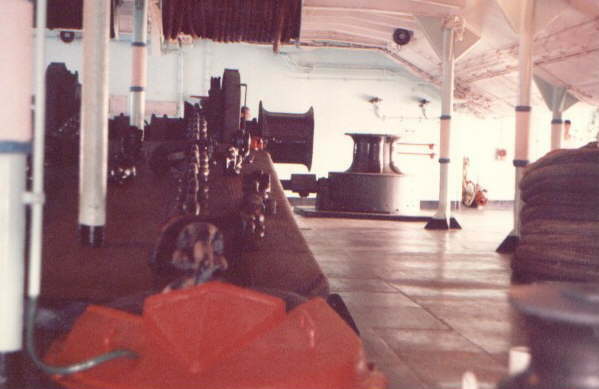 The bow of the ship, directly under the flight deck. 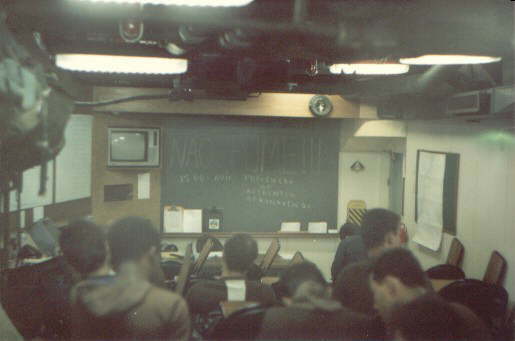 Number 2 briefing room, destined to the flight crew of the 1º GAE when aboard. 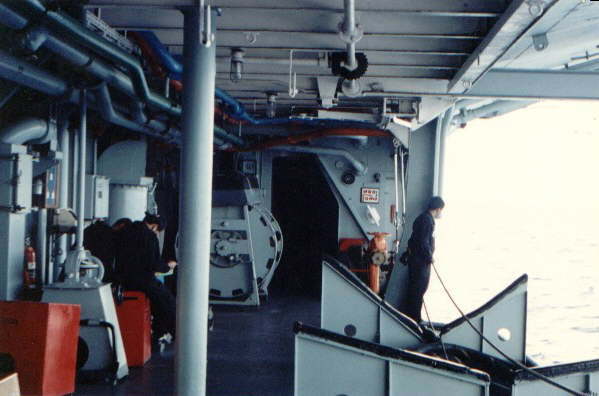 The photo that shows the blackboard faces aft, and the door at the right hand side, accesses a corridor that leads to the gallery deck level to the stern (left), and to the forecastle (right). 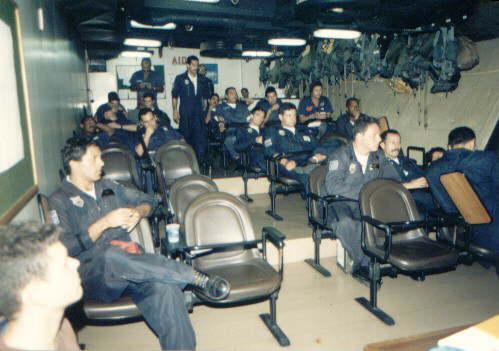 This photo of briefing room 2 faces forward, the inclined right side wall is the very side of the ship, just below the island. 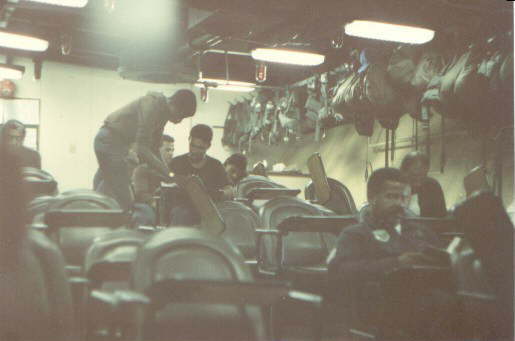 There are three briefing rooms in the ship, all of them accessible by the same corridor, just walking down towards the bow. Another view of briefing room 2 looking forward. Note the inclined right hand wall, that corresponds to the hull side shape below the island. The hanging material is the personal flight gear of aircrews, each with it's own hanger. Sgt. 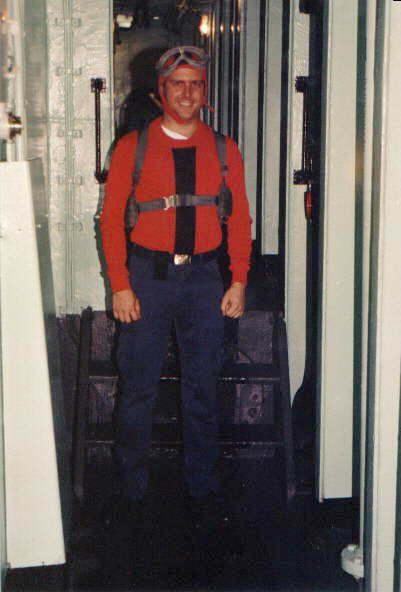 Luis Thiesen below decks, dressed for the flight deck. 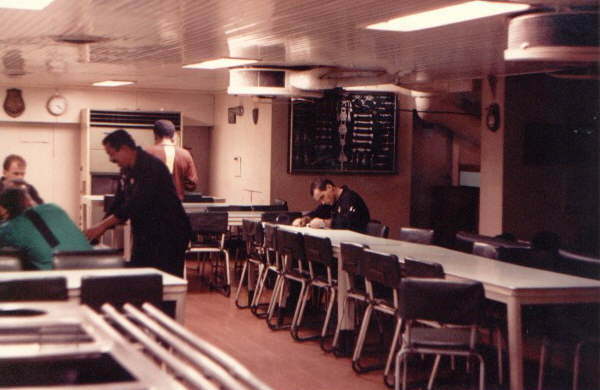 The Sergeant's mess, looking aft. The ship's chapel, looking forward on the 5th deck level, well below the water line. 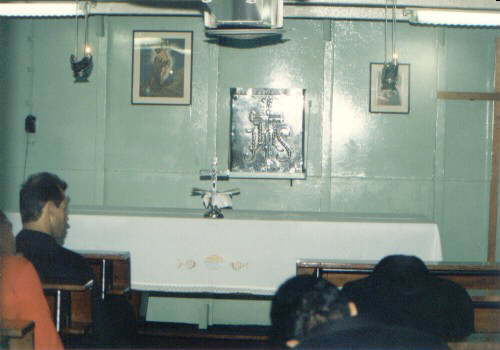 The chapel is used for all the religious denominations aboard. 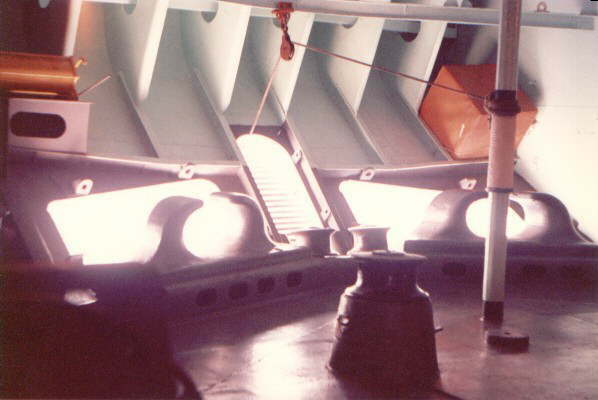 Ship's boat mooring, starboard side. 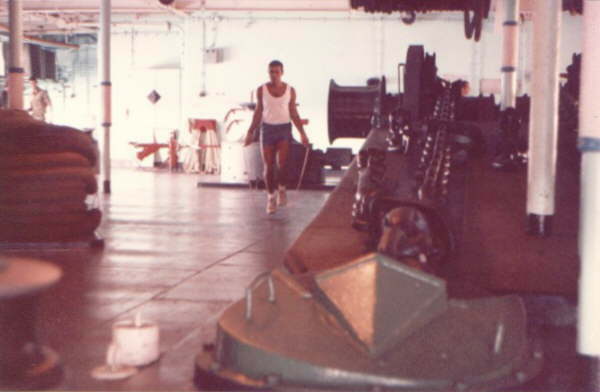 Entrance to the hangar deck. 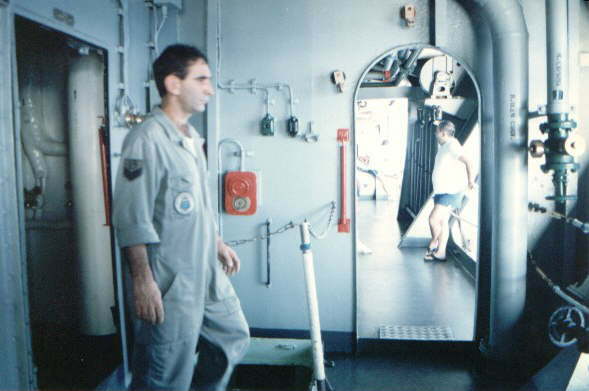 (Brazilian Navy personnel).